At Christmas it’s always nice to try something new. 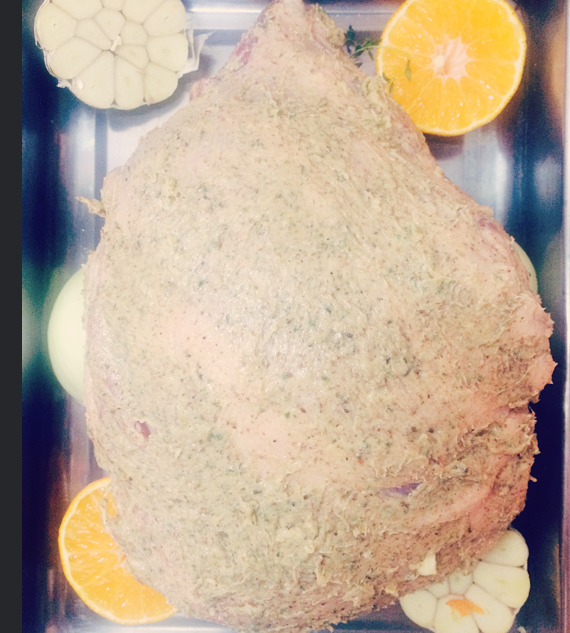 In my family we would always have two meats on Christmas day; Turkey and another meat such as Goose or Lamb. 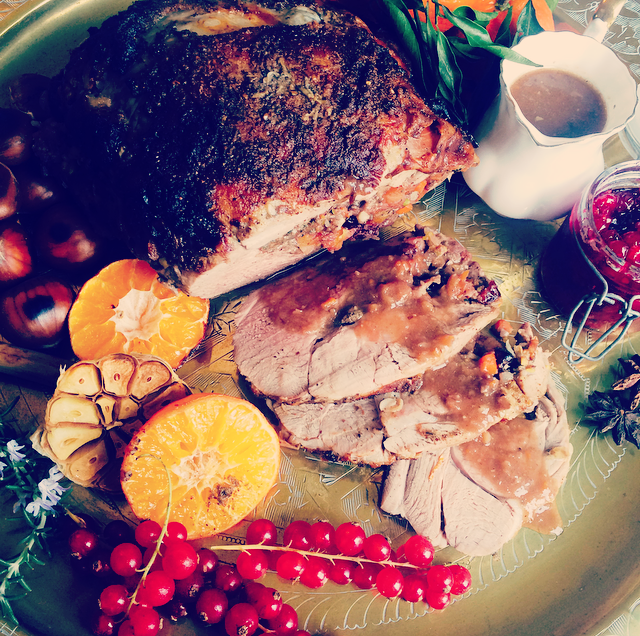 This recipe is a great Christmas roast alternative. Living in Spain, I wanted to include the flavours of the Mediterranean and my focus was Morocco. I still wanted to keep what I feel are the traditional flavours of Christmas such as clementine’s, cranberries and Port. Remembering an old Moroccan Lamb dish which I have cooked in the past, influenced me. It was made with a stuffing of couscous, prunes, figs and apricots. The meat was rubbed all over with a spiced butter, so taking this process I came up with this recipe. 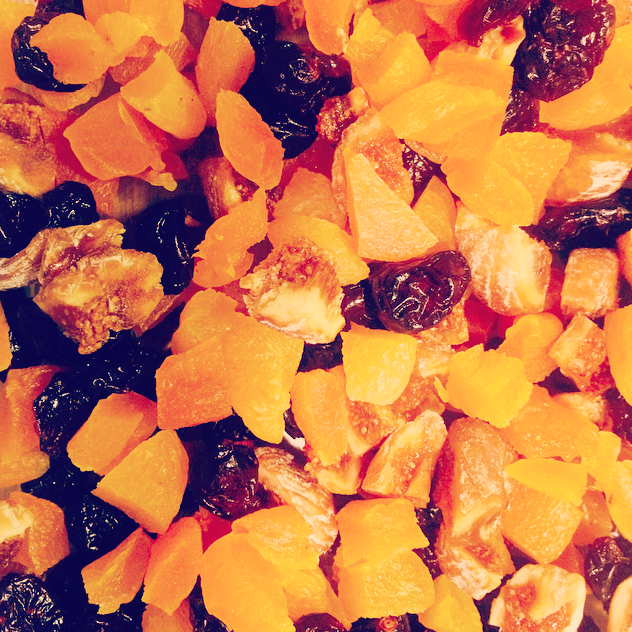 My fruit of choice was cranberries, apricots, figs and fresh clementine’s which I soaked overnight using the same method as making a Christmas cake, but the fruit is soaked in Port rather than Brandy. 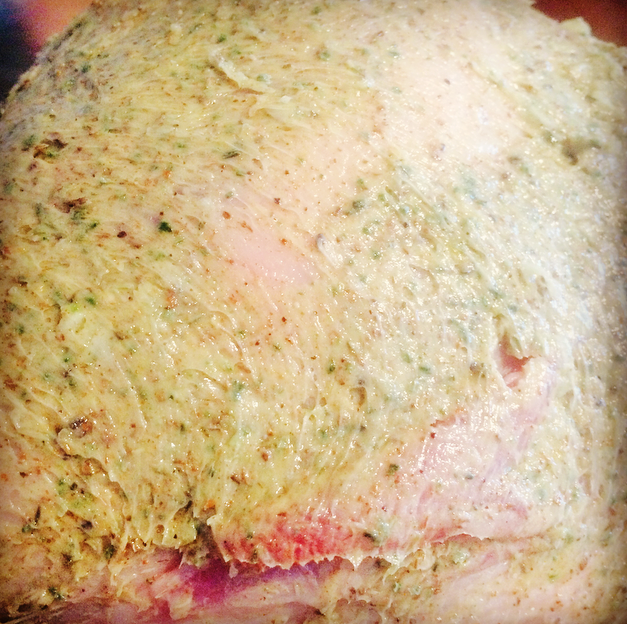 The butter rub has fragrant spices such as cinnamon, star anise, cloves but also a little fresh rosemary. These flavours are quite usual for Moroccan Tagines but also have the festive aroma and taste. The Lamb is cooked pink and the taste is rich and fragrant. The great thing about this dish is you can serve it with your regular Christmas day trimmings or spice it up and make cumin roasted carrots or honey roasted sprouts. 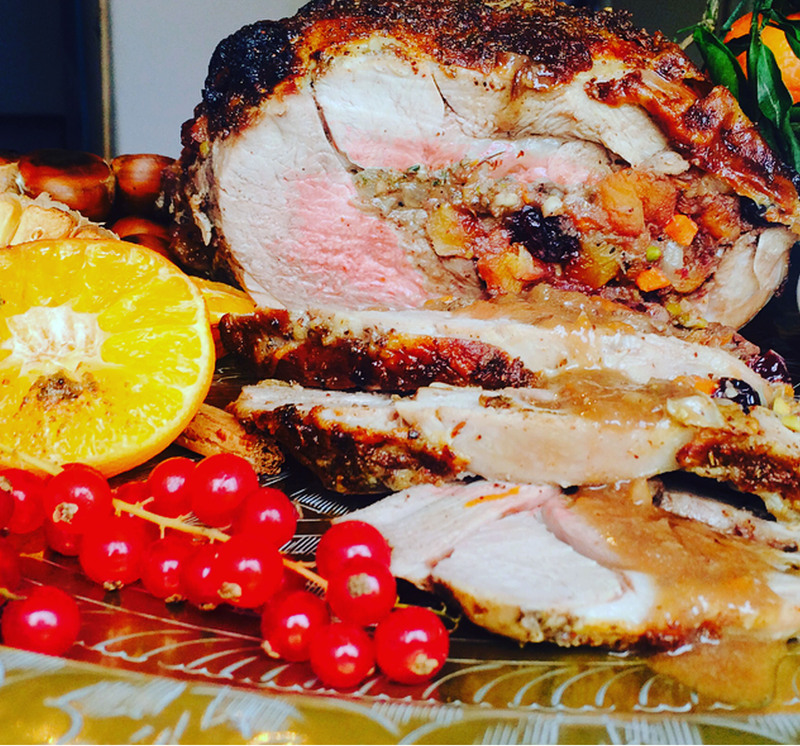 Or as an alternative, you can have a totally different Christmas dinner and serve this with a buttery couscous or tabbouleh. The choice is yours! Soak the fruit overnight before cooking. 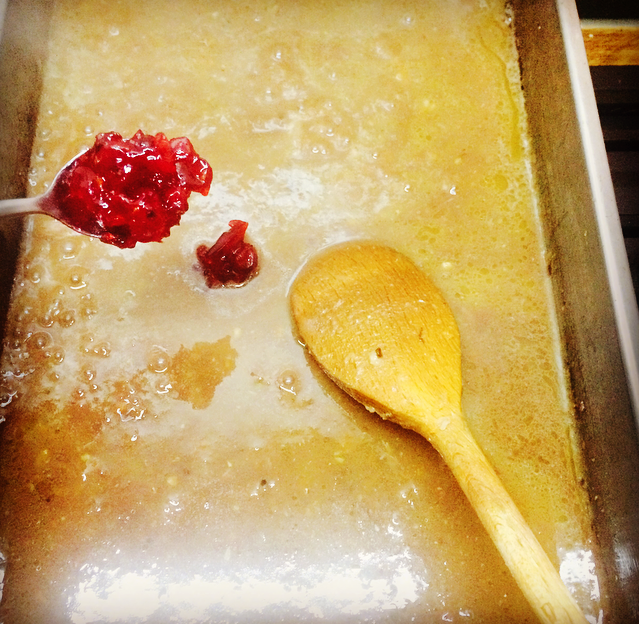 Take the apricots and figs and dice, then mix the cranberries in and pour over the port. Cover well and leave overnight. You can also prepare your stock the night before. 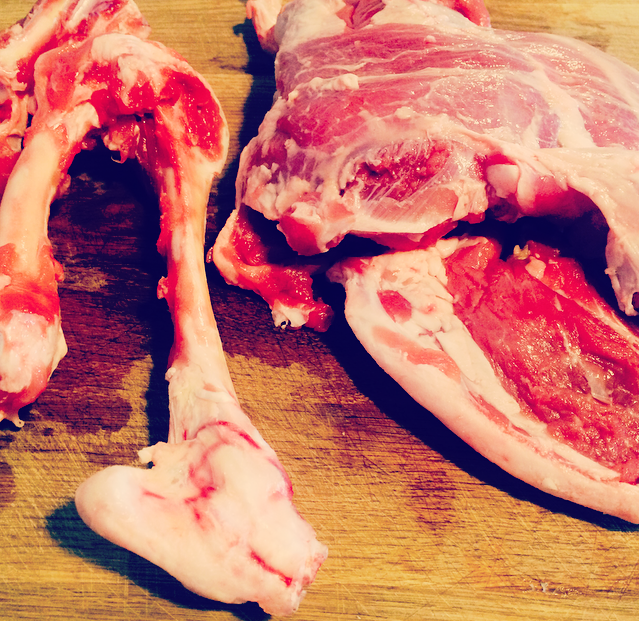 Place the lamb bones into a oven tray with the carrot, onion, celery, bay leaf and water. Cover with foil and stick into a pre-heated oven at 220 degrees for 1.5 – 2 hours. Make sure you keep checking the stock during this time to make sure the water does not dry out. 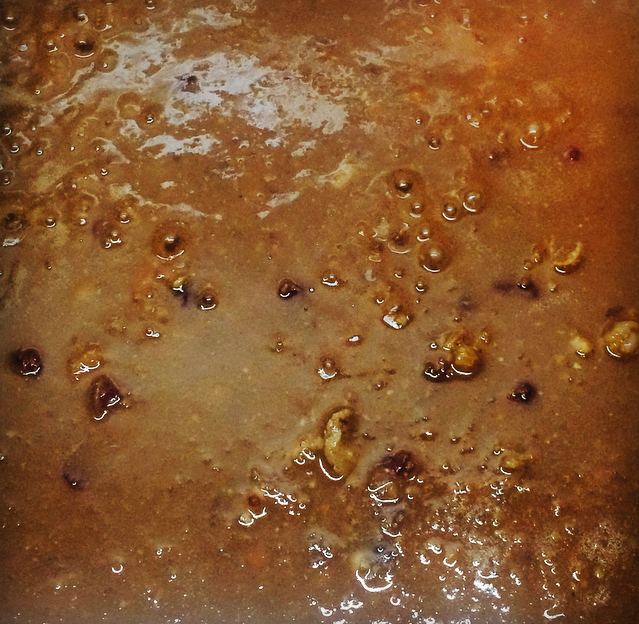 The idea is to get a rich condensed roasted lamb stock. Add a little more hot water if needed. 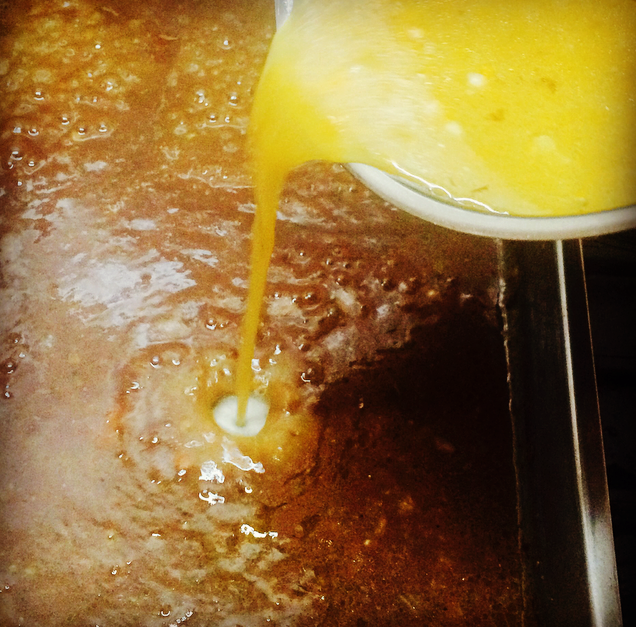 After the cooking time, remove the bones and the celery, then with a hand blender blitz the stock. Try to scrape all of the lamb juices from the oven dish. Let the stock cool then cover and place in the fridge until required. The next day the fruit should have expanded and soaked up most of the port. Add the zest of the clementines, the breadcrumbs and pistachio nuts. 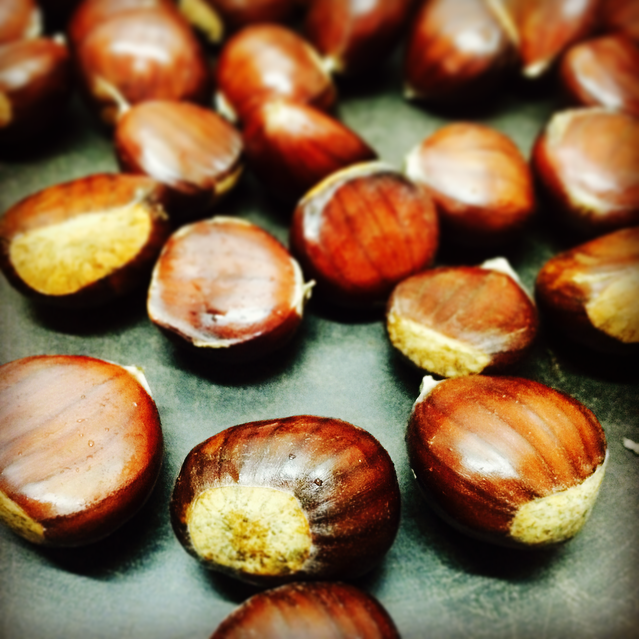 Crumble your chestnuts and add to the fruit. Set this aside. In a frying pan melt the knob of butter and add the onion and carrot, gently soften but do not brown. Let this cool then add to the fruit. 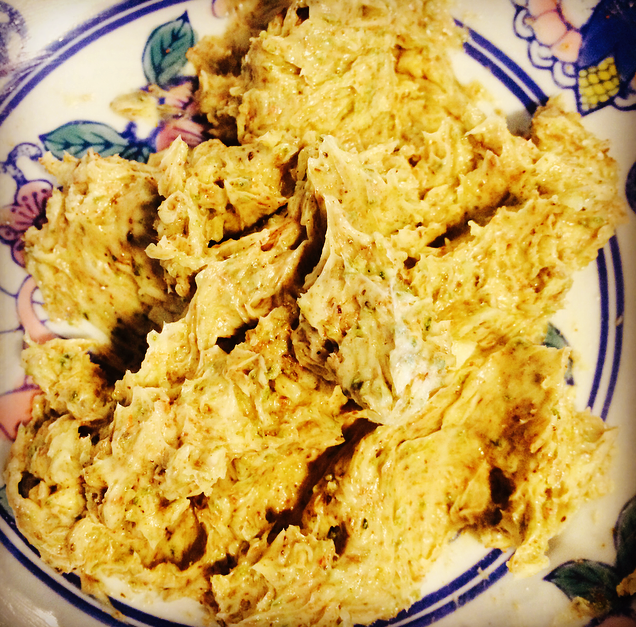 Place your butter in a bowl and grate in the garlic mix well and set aside. In a hand blender (I use a coffee grinder to grind my spices) grind the cinnamon stick, star anise, cloves, nutmeg, salt and pepper. Next add in the rosemary leaves, if you are not using a coffee grinder it might be best to chop these finely. Add these spices to the butter and garlic mix. Set aside. Carefully slice the opening a little wider. Just so you have a little more room to stuff. Dab the inside of the meat with a paper towel to dry it a little. Rub 3/4 of the spiced butter into the inside, reserving the rest for later. Next get the fruit stuffing, get a handful and squeeze it into a compact ball. 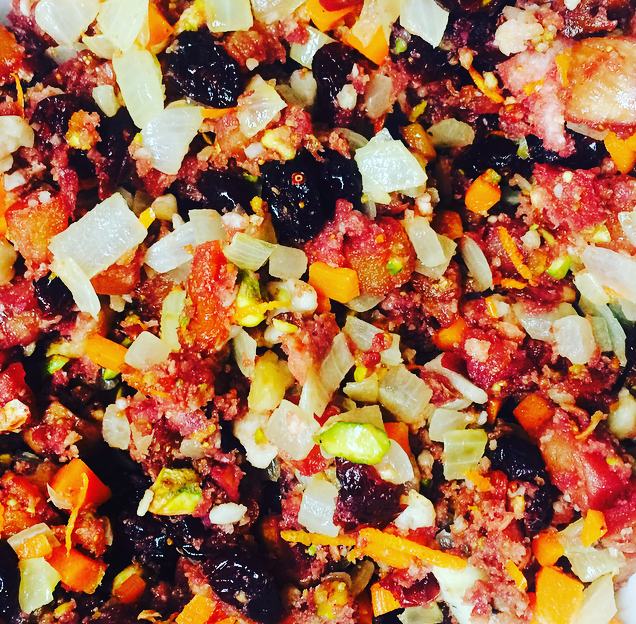 Stuff this into the Lamb, pushing to compress the stuffing. Keep going pressing the mixture in well. The idea is to get as much of the stuffing in as possible, I managed to fit practically all of it in! 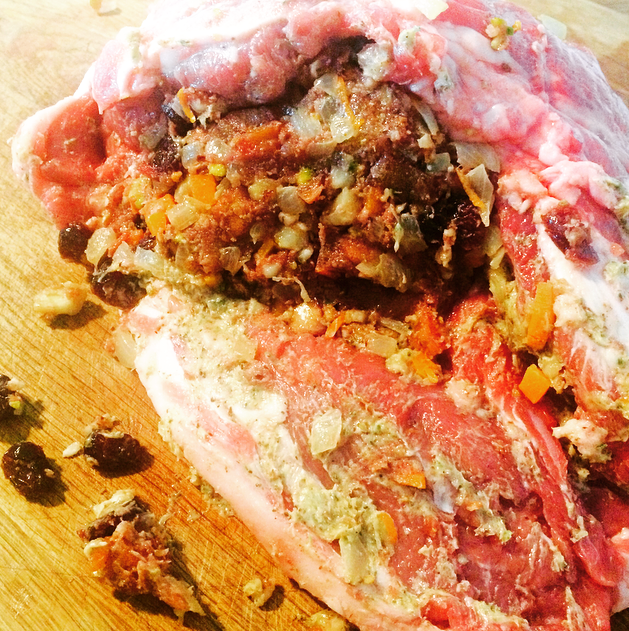 You want to be able to slice through the Lamb without the stuffing falling out when cooked. Turn the Lamb on its side to push down the stuffing a little further. 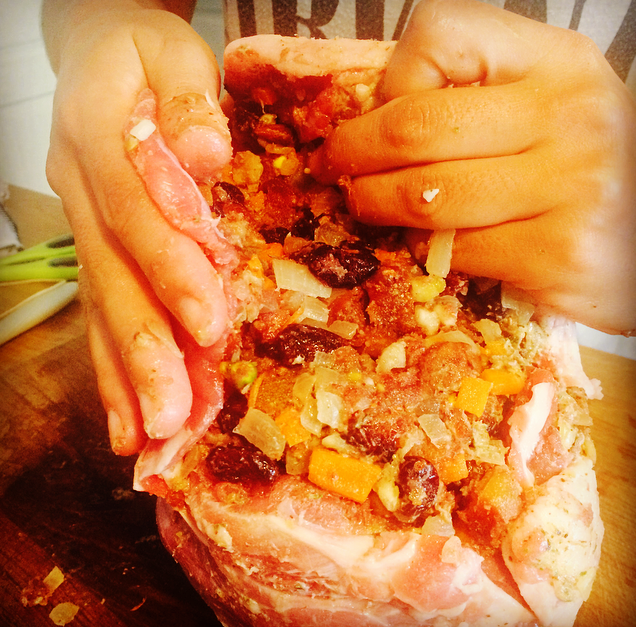 Try to tuck and fold the meat edges so there are no holes for the stuffing to fall out. 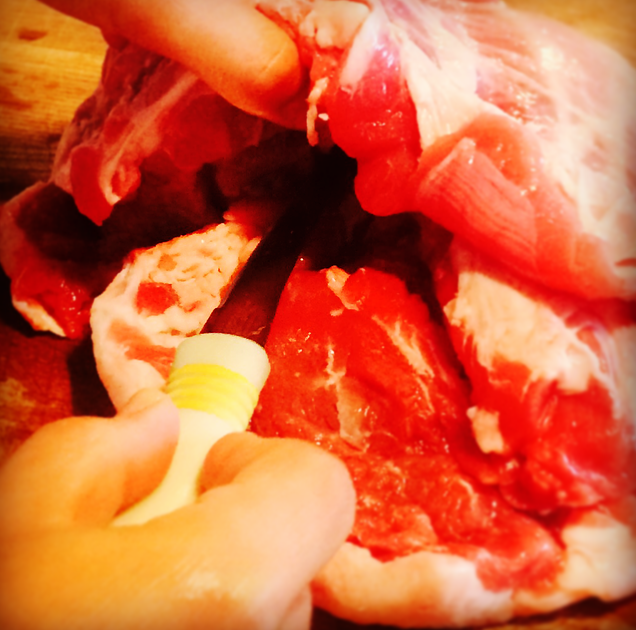 Thread the needle with the butchers twine, insert into one edge of the cavity and tightly make a secure knot. 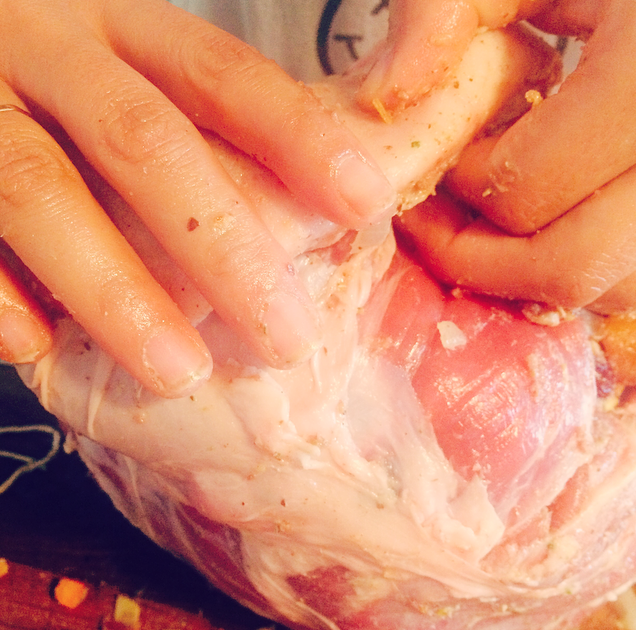 Keep tucking and pulling the meat as you stitch it up. 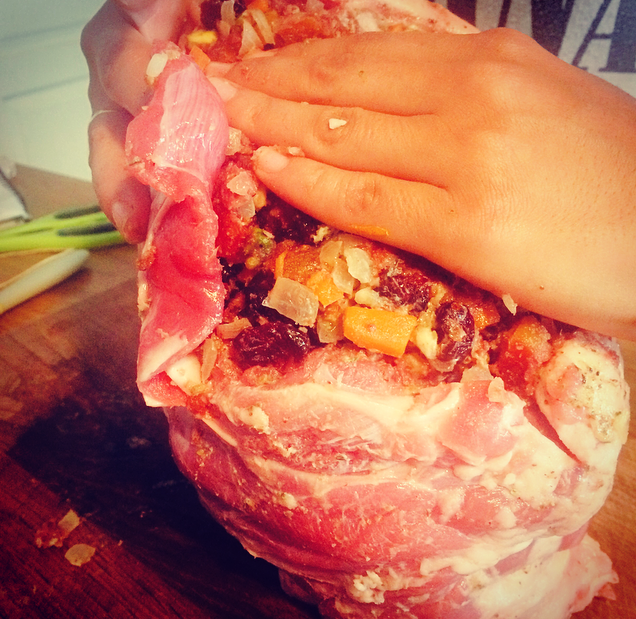 Wrap the meat edges over each other to secure the stuffing. Make a tight knot at the end of stitching. Season with salt and pepper. Rub the remaining spiced butter over the top of the Lamb. In a oven dish place the carrot, onion, clementine halved, thyme and the garlic bulb halved. Place the Lamb on the top. I added a little bit of water in the bottom of the dish, about 200ml. Place in the oven uncovered. 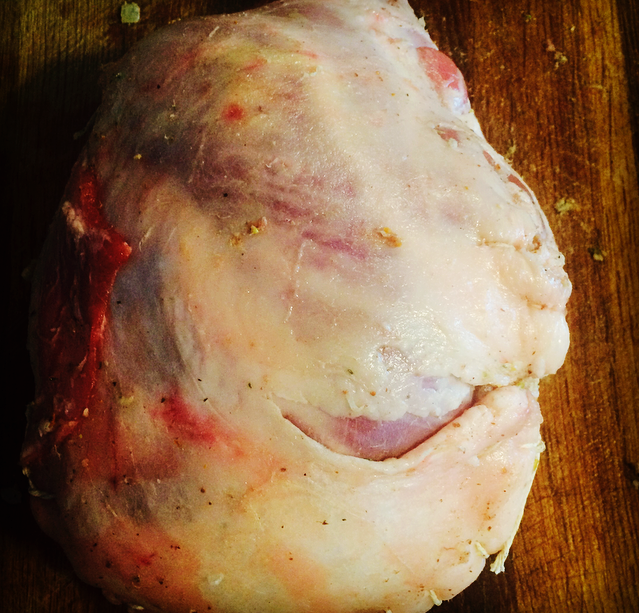 Roast for 1 to 2 hours (depending on your meat size) or until the juices run slightly pink when pierced with a skewer. If you have a meat thermometer insert into the thickest part of the meat, the temperature should read 57-60 degrees for medium rare. My Lamb was 2kg and took 1 hour 20 minutes to cook. Remove from the oven, lift the Lamb carefully from the tray and set aside to rest. I would cover with foil, it needs at least 20 minutes to rest. You can now make your gravy. Place the oven dish straight onto the hob on a high heat. Remove the garlic and clementine and reserve for later. 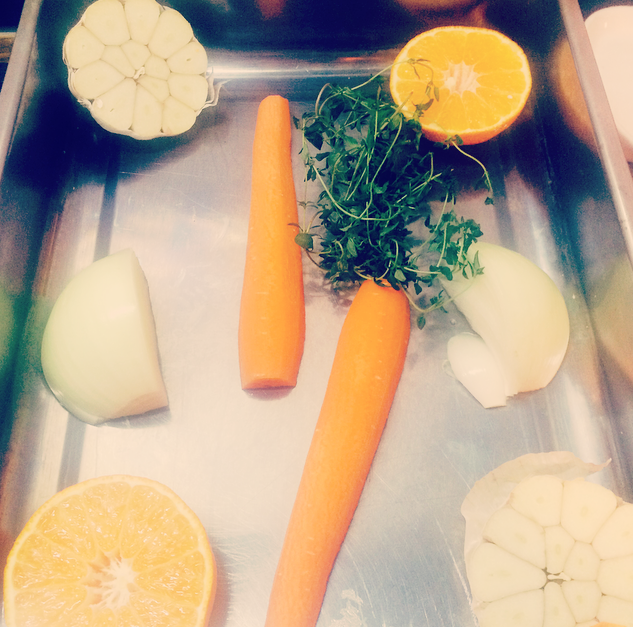 Discard the carrot and onion as you already have carrot in your pre-made stock. Stir and scrape all of the juices from the pan, add the flour and whisk well so it doesn’t turn lumpy. Pour in the Lamb stock you made the day before. Add in the redcurrant sauce and stir. Taste the gravy, add salt and pepper if needed. Let it bubble away and thicken. You are now ready to serve up, I served this with the garlic and clementine from the roast. Hope you enjoy this recipe, Merry Christmas!! Soak the fruit overnight before cooking. 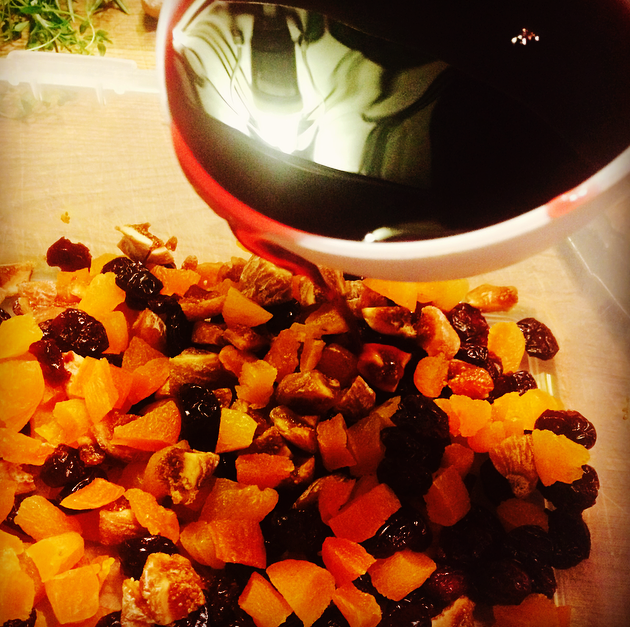 Take the apricots and figs and chop small, then mix in the cranberries and pour over the port. Cover well and leave overnight. You can also prepare the stock the night before. 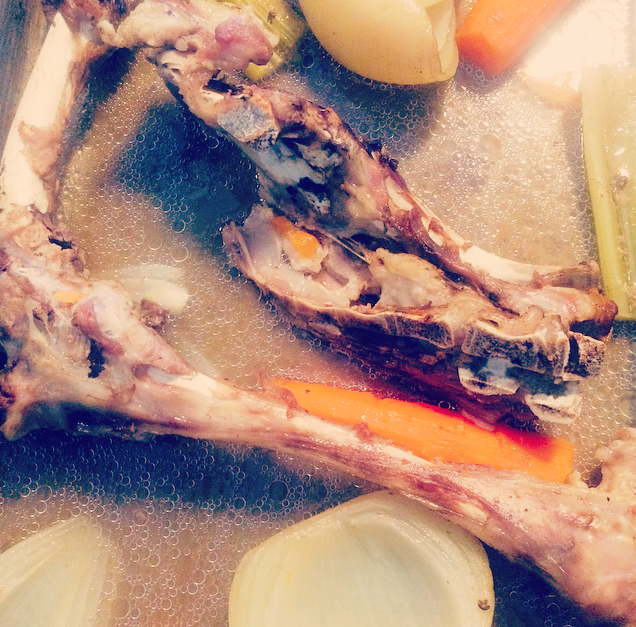 Place the lamb bones into an oven tray with the carrot, onion, celery, bay leaf and water. Cover with foil and place into a pre-heated oven at 220 degrees for 1.5 – 2 hours. Make sure you keep checking the stock during this time to make sure the water does not evaporate. The idea is to get a rich condensed roasted lamb stock. Add a little more hot water if needed. 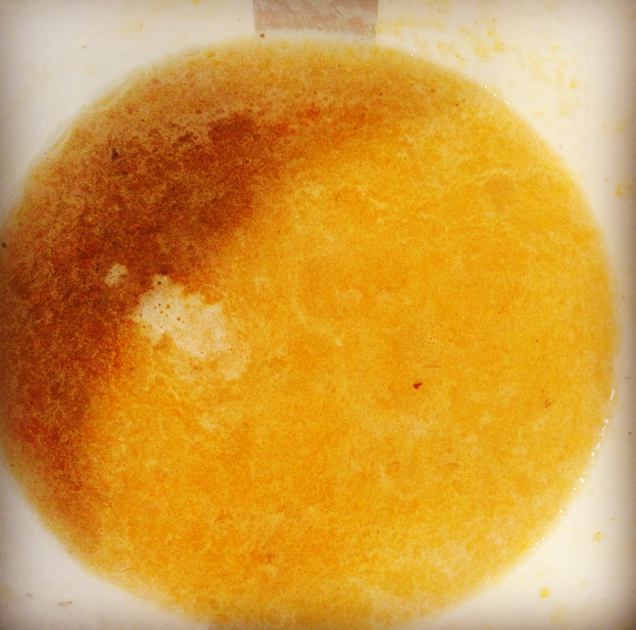 After the cooking time, remove the bones and the celery, then with a hand blender blitz the stock. Try to scrape all of the lamb juices from the oven dish. Let the stock cool then cover and place in the fridge until ready to use. The next day the fruit should have expanded and soaked up most of the port. 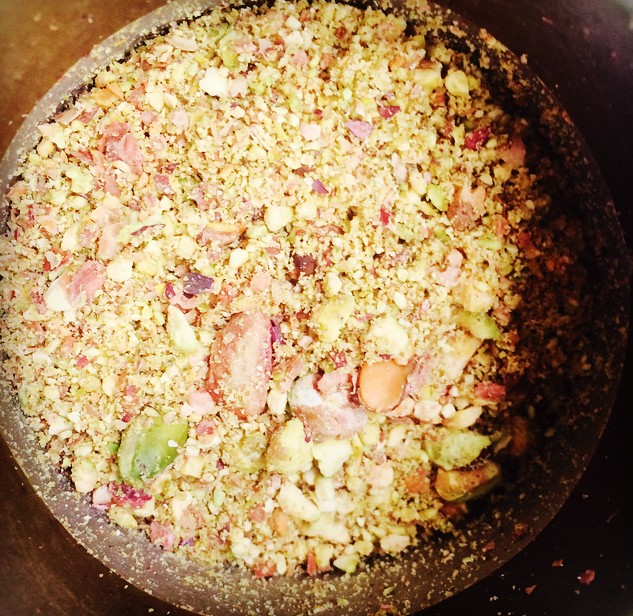 Add the zest of the clementine’s, the breadcrumbs and pistachio nuts. 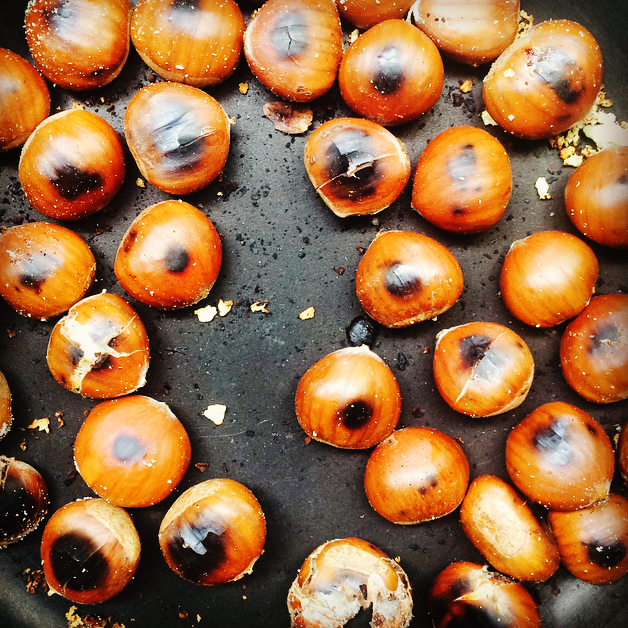 Crumble your chestnuts and add to the fruit. Set this aside. In a frying pan melt butter, add the onion and carrot, gently soften but do not brown. Let this cool a little then add to the fruit. This is your stuffing. 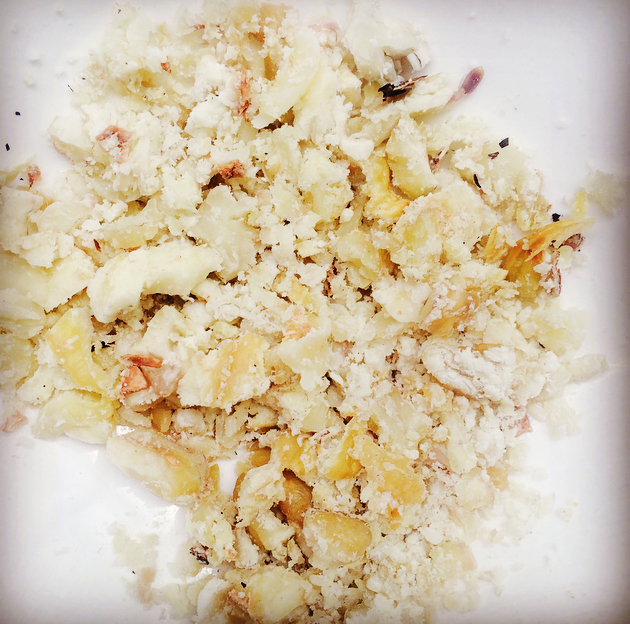 Place your butter in a bowl and grate in the garlic mix well and set aside. 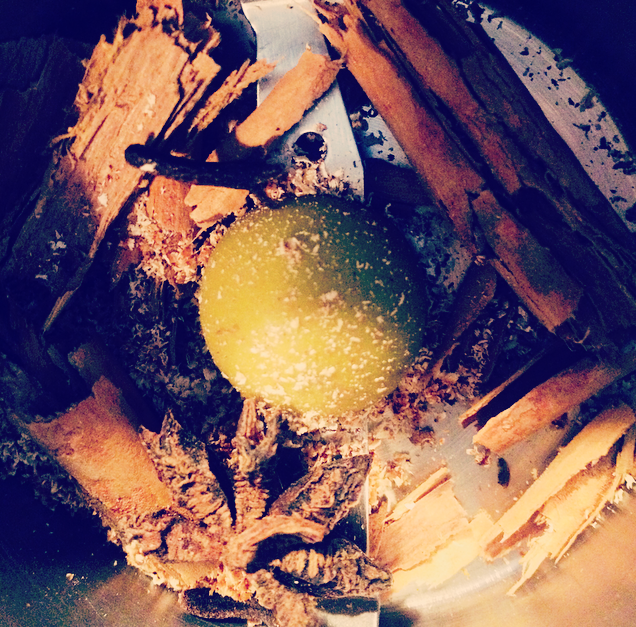 In a hand blender (I use a coffee grinder to grind my spices) grind the cinnamon stick, star anise, cloves, nutmeg, salt and pepper. Next add in the rosemary leaves, if you are not using a coffee grinder it might be best to chop these finely. Add these spices to the butter and garlic mix. Set aside. 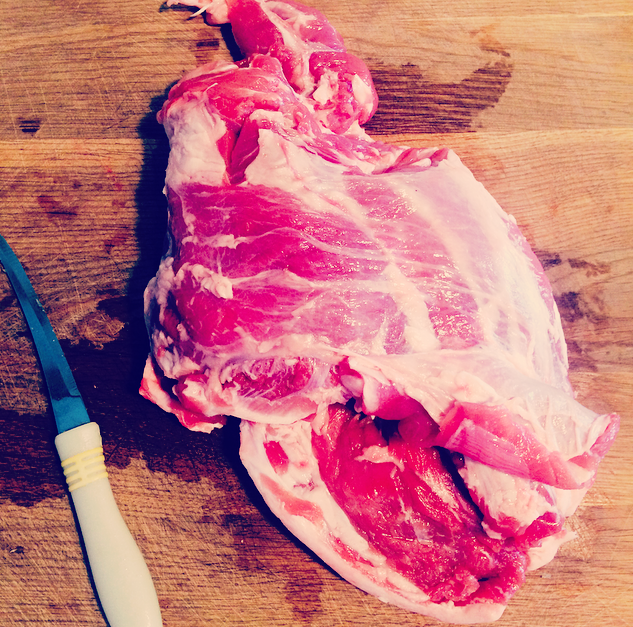 Take the Lamb and carefully with a sharp knife cut the opening a little wider, just so you have a little more room to stuff. Dab the inside of the meat with a paper towel to dry it a little. Rub 3/4 of the spiced butter into the inside, reserving the rest for later. 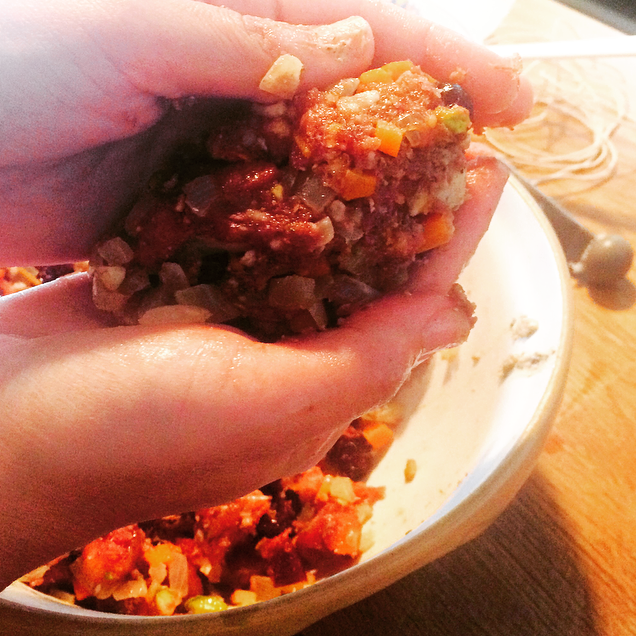 Take the fruit stuffing, get a handful and squeeze it into a compact ball. Stuff this into the Lamb, pushing to compress the stuffing. Keep going pressing the mixture in well. The idea is to get as much of the stuffing in as possible, I managed to fit practically all of it in! 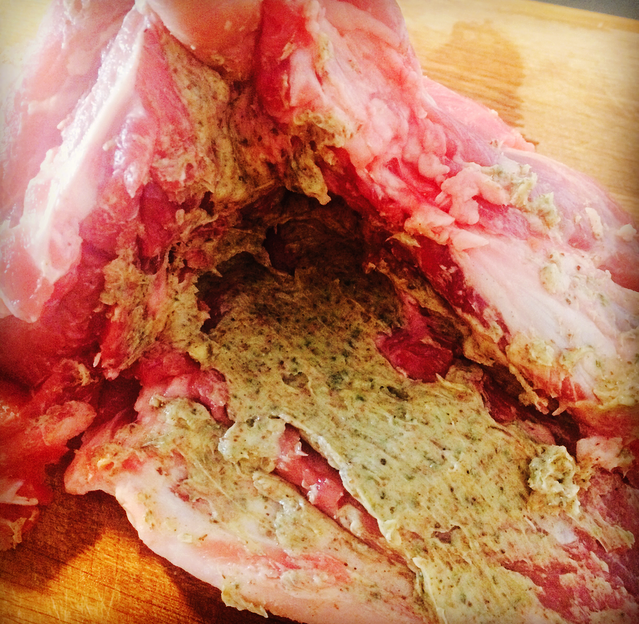 You want to be able to slice through the Lamb without the stuffing falling out when it is cooked. 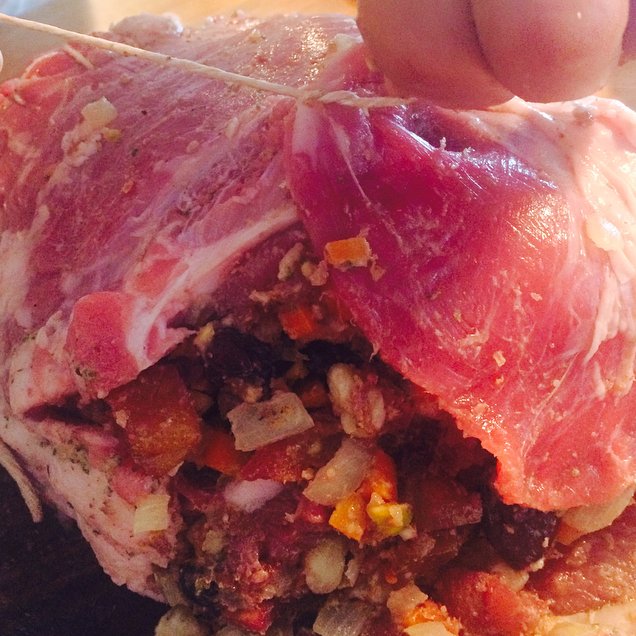 Turn the Lamb on its side to push the stuffing down a little further. 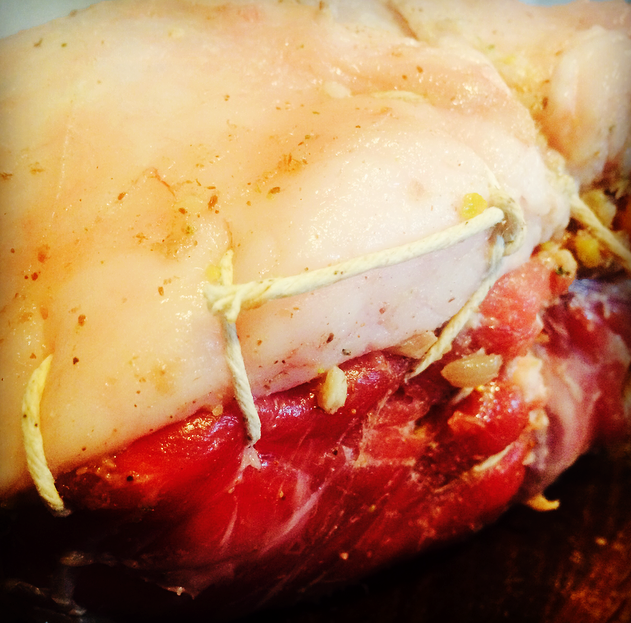 Thread the needle with the butchers twine, insert into one edge of the cavity and tightly make a secure knot. Keep tucking and pulling the meat as you stitch it up. 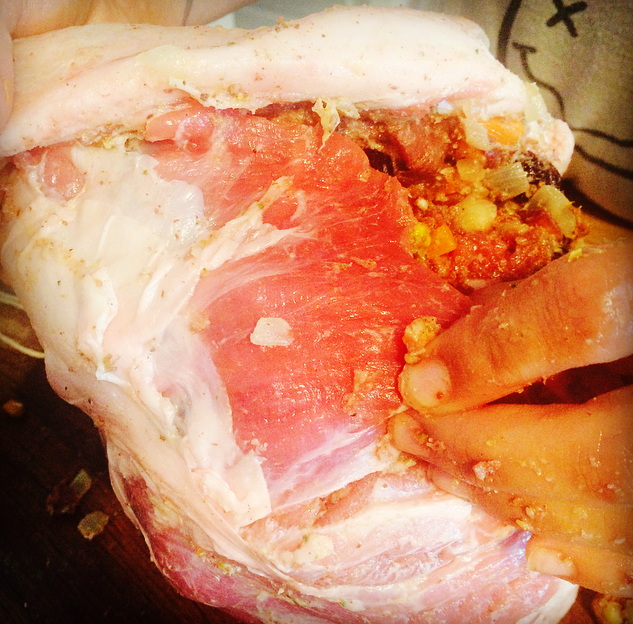 Wrap the meat edges over each other to secure the stuffing. Make a tight knot at the end of stitching. Season with salt and pepper then rub the remaining spiced butter over the top of the Lamb. 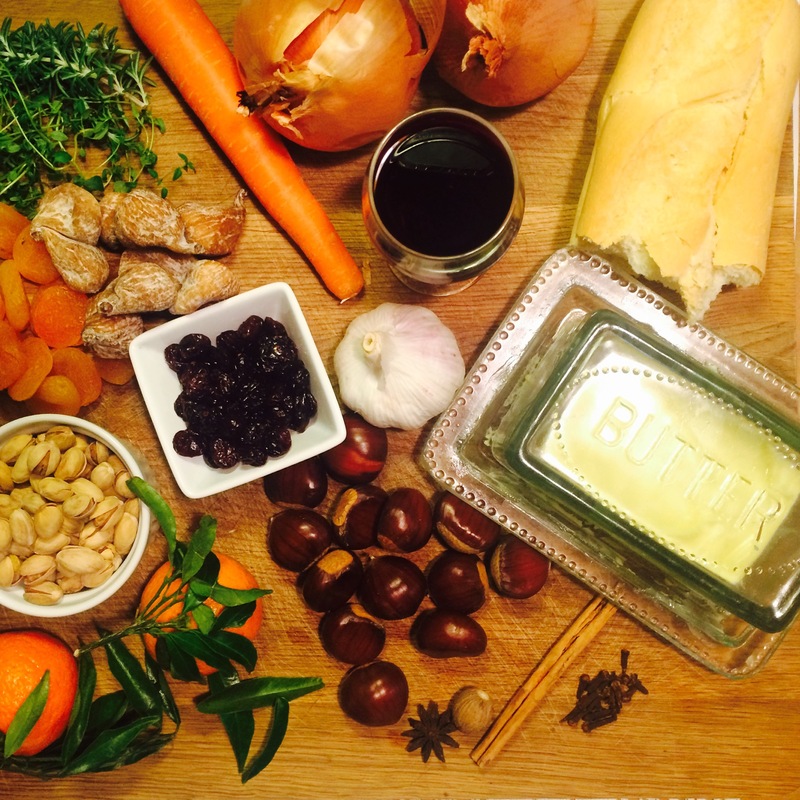 In an oven dish place the carrot, onion, clementine halved, thyme and the garlic bulb halved. Place the Lamb on the top. I added a little bit of water in the bottom of the dish, about 200ml. Once cooked remove from the oven, lift the Lamb carefully from the tray and set aside to rest. I would cover with foil, it needs at least 20 minutes to rest. You can now make your gravy. Place the oven dish straight onto the hob on a high heat. Remove the garlic and clementine and reserve for later. Discard the carrot and onion as you already have these in your pre-made stock. Stir and scrape all of the juices from the pan, add the flour and whisk well so it doesn’t turn lumpy. Pour in the Port, then pour in the Lamb stock you made the day before. Add in the redcurrant sauce and stir. Taste the gravy, add salt and pepper if needed. Let it bubble away and thicken. I hope you enjoy this recipe and have a lovely Christmas.